My computer recently changed locations on the company internet. I have been using Direct Modeling Express for several years successfully but now I get a proxy request and warning when I start. It looks like I'll be thrown out after 72 hours? I clearly have internet access. The company IT support is not sure what type of Proxy information Direct Modeling Express requires. Proxies are not generally used, they say. Thanks for any help to get around this issue. Re: Direct Modeling Express Proxy Issue? This issue has been resolved as indicated by Michael Siegenthaler‌ on this discussion: PTC License Server for Creo Elements Direct Express dead/removed? it seems many have the same problem and you're not alone. May be the license server is down. Something has glitched for PTC. that gives you again 72 hours working time. I have been having that same issue for a week. I have tried it from multiple locations to veriy it was not my computer or internet connection. Looks like it has been down for about a week. I too have had this issue. I was trying to evaluate Creo prior to purchasing a full license, when suddenly, it wont work anymore. I have checked and re-checked my machine. The fault does not lie there. I have tried a fresh install on a standalone machine and a new registration, same fault. 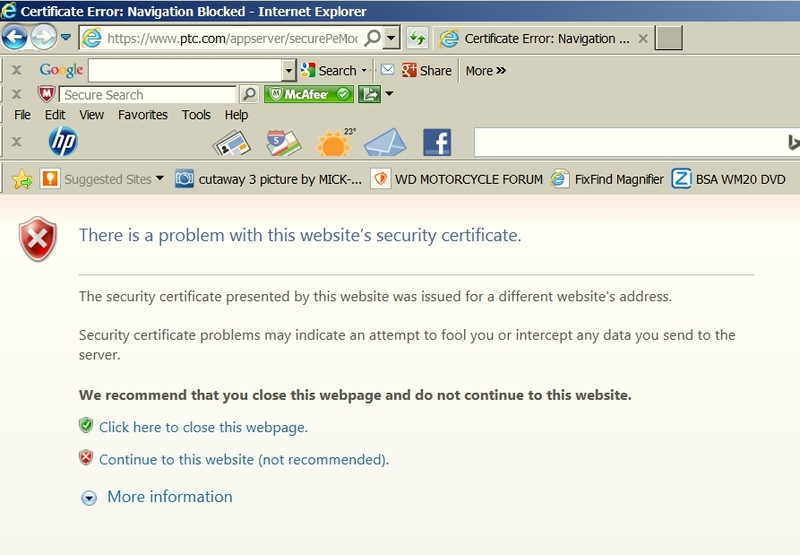 When logging on to thier site this is successful but I get an security certificate error. I presume that this is the problem but have no way of proving it. I desperation I have tried on several occasions to get PTC's help but have restricted access to support. Published email addresses are bounced and sale will not respond. It seems that they just don't care and are totally unwilling to help in any way. I for one will treat this as the level of support that PTC will give their full product client too and am no longer bothering. Im going back to a company which offers support. I have also been having this same issue for about a week. The frustrating part is there does not seem to be any way to notify PTC directly as I do not have sufficient Privileges. In our company, we have exactly the same problem. Does anybody know a solution? The only solution is to somehow contact PTC and get them to fix it. I'm considering contacting sales and getting them to notify PTC support. I think the issue at PTC is bigger than this. I have full support and have been having issues with my bookmarks not working. However, if I got to PTC and then to support I can get to the page. I think maybe some of the addresses have changed.